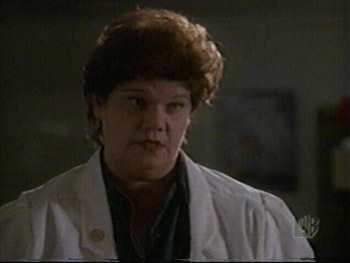 The Blood Bank Lady (or she could be a doctor, I suppose, but I prefer to call her this) is one semi-villainous person Buffy deals with when she's run away from Sunnydale. When Lily's beau Rickie is missing in action, Buffy and Lily stop by the blood bank. They think maybe Rickie's gone in for cookies and money, which is vastly different from going somewhere for cookies and milk. Anyhoo, the Blood Bank Lady pretends to scrutinize her records and tells the chicks that Rickie hasn't been by, but she'll let him know they were looking for him. Yeah, right. Basically, this woman -- 'cause she's not really a lady, but again, it's the name that I like -- reminds me of Nurse Greenliegh from Go Fish, Season 2. And before you get any ideas, it's NOT because of their similar looks. But now that you mention it, there IS something porcine about them...and they're both semi-evil, and we all know how Joss (or someone who writes for this show) feels about pigs. (In case you forgot..pigs=evil...with the exception of Mr. Gordo, Buffy's stuffed pig.) Anyhoo, I think Nursey and Dr.-y (okay, so here the Dr. title works) are similar because they both seem to have a sense of regret about what they're doing with the teens. In Fish, Nursey feels bad about exposing the boys to fish 'roids (heh, the DNA-laced steroids)...and she's vocal about it. Maybe that's why she dies. However, here, although Blood Bank Lady doesn't exactly plead forgiveness or say that she thinks it's bad to be telling Ken which young donors are healthy candidates, she kind of gets this grimace-y, oops-maybe-I've-been-a-bad-person look on her face after Buffy leaves with the info. Then again, if she really didn't have any remorse, maybe that's why she didn't die in this ep. Heh. Pic courtesy of Phred, Sunnydale High School. This page last updated on December 1, 1998.